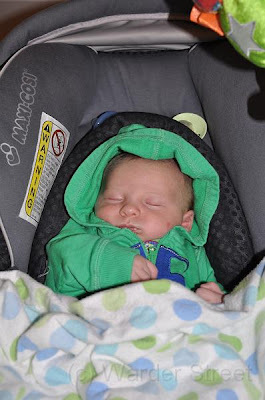 Baby William: My baby is ONE MONTH OLD! As all you devoted followers of William's development have probably noticed I am a little behind in updating the blog! I apologize and will try to keep on top of it better in the future. At any rate, there has been a lot going on. Last week (week 3 of William's life if you are counting) William and I decided we had to get out of the house! 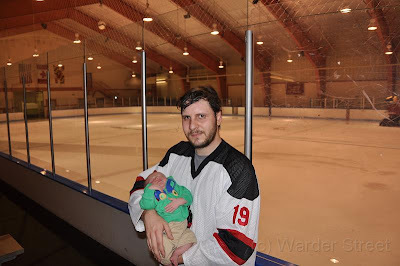 First we went to cheer on Daddy at his hockey game. Given that it's so hot here (82 plus degrees every day) this was William's first time wearing pants and a hoodie. They were a trifle big but he was so cute! After the game William wanted a picture with his Daddy in his hockey gear. Taylor was a little sweaty but William didn't mind! On Wednesday, we met friends Andie and her son Miles for lunch in Arlington. Miles is 5 and a half months. It was so cute to see them together and to watch Miles learn to sit up on his own. It's amazing how quickly babies change and grow! I completely forgot my camera but I promise next time we'll have pictures. After our lunch with Andie and Miles, William and I ran some errands and then went to the salon so Mommy could get her hair returned to it's natural blond state. When Taylor got home from work on Thursday we drove to New York to surprise the Chesnik family for the weekend! It was cousin Scarlett's 2nd Birthday and William wanted to be there to celebrate with her. We had a great time on Long Island and in Southampton with the family! It was a great weekend however Taylor and I were horrible about taking pictures! This is a public plea to Erin to email us pictures of William and Sabina and William with Stacia and Emily and William with...well everyone please! 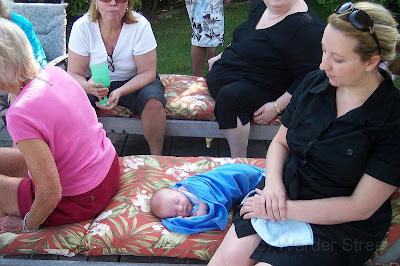 After meeting everyone William needed a quick nap by the pool. Here is William with Jess and the soon to arrive Brielle, and the birthday girl Scarlett! 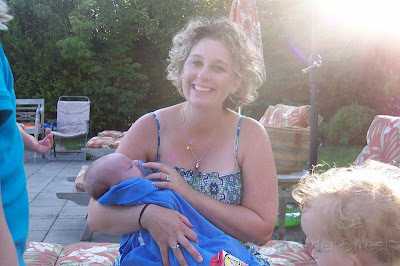 Here is William with Erin! (And the as of yet unnamed new arrival who will not be known as Diego!) 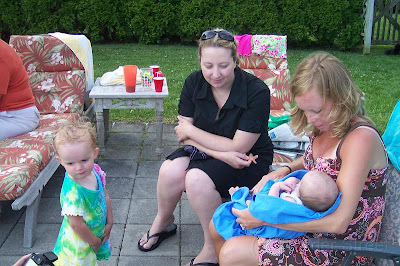 Shortly after this picture was taken, Scarlett demanded that Erin return William to me! 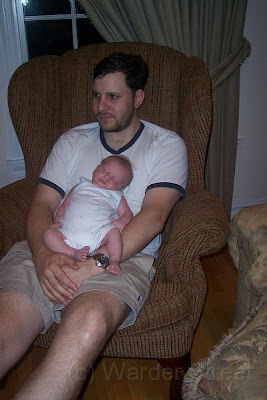 It was a long and exciting day and William was happy to cuddle with Daddy that night! I can't believe that my baby is one month old! He's changed so much in just a short time. He's bigger now and much more alert. He spends more time awake and staring at things. 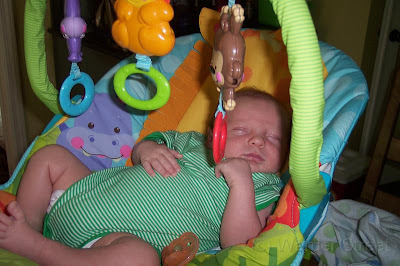 Here he is in the bouncy chair Grandma Susan bought him to use at her house. He loved the monkey! He has definite preferences. He loves to sleep on his side or stomach but does not like to play on his stomach. He loves to take a bath. He does not like laying on his back when no one is playing with him but he loves to lay on his back under the play mat (thanks Erin and Maureen! Pictures are coming!) He likes to look at himself in the mirror and sit in the swing. While it's so much fun learning more about his personality I can't help being just a little sad that he's growing so fast. But I can't wait to see what the next month brings!